different story, same ending - who is nicka smith? (featured photo credit: Lacy Atkins, The Chronicle) as part of my contribution to the project shine in peace (@shine_in_peace), i’ve been doing quite a bit of research on the violence in the streets of oakland. 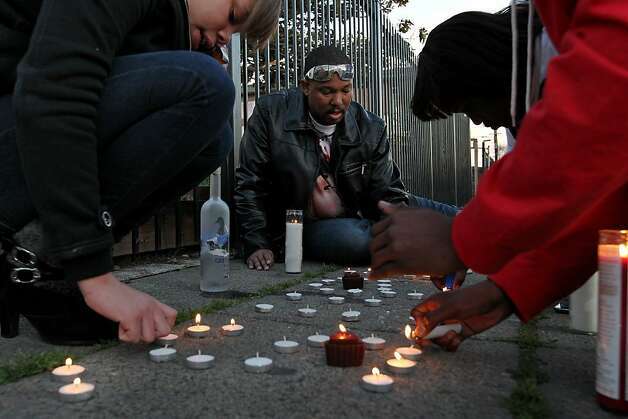 last night, i happened to come across a photo essay in the san francisco chronicle detailing the death, funeral, and the aftermath of lamont deshawn price, who was murdered on thursday, february 16, 2012 on the 8100 block of birch street. he was oakland’s 18th homicide during the year 2012. the article detailing the shooting and lamont’s death was alarmingly short, featured no details outside of a basic lead for a story. yet, the comments left by “liberal” san franciscans/bay areans tell a much different story. as i took a look at the comments for the photo essay, which was released this march, the armchair quarterbacks took aim even more. 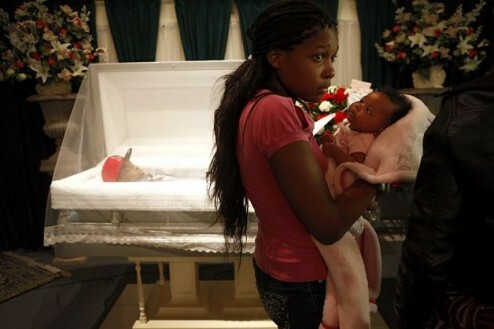 especially after discovering that lamont had a five week old daughter, was buried in a red baseball hat, his family and friends made t-shirts, and it was mentioned that he had a juvenile record. many noted that something needed to be done about “these” people regarding “their” problems. several readers also remarked on the fact that there was a bottle of grey goose at the sidewalk memorial site when the family commemorated the anniversary of lamont’s death this february. funeral and mourning practices aside, fast forward to today’s news. audrie pott, a 15 year old girl from saratoga (read that: across the bridge from oakland, totally different environment), committed suicide last year, eight days after being assaulted by three 16 year old boys and having photos of the assault posted online. audrey was reported as being passed out on a bed at a house party when the boys took advantage of her. very few readers commented on the circumstances which lead to the assault on audrie. condolences were widespread for the young woman and her family. why even talk about the two situations together? apples and oranges? on the surface these are two different stories. when you look deeply, they aren’t that different. they both ended the exact same way. two young people are dead for no reason, and the “world” seems to favor one story more than the other because of appearances. really, these deaths are symptomatic of a larger societal issue. has anyone considered that the violence taking place in cities like oakland or chicago may be suicide or even quite possibly the result of years of bullying or coercion? if you live in an inner city environment, with few options, there’s a high likelihood that it’s easier for you to be lead into the street life. this is especially the case if you don’t know anyone doing any better or haven’t been exposed to better. furthermore, if there is a lack of legitimate economy in your environment (read that no real options for work outside of the drug game), where else are you going to go for opportunities? you’d much rather have a life that eventually ends up incarcerating or killing you quickly. At least you have a chance at something. bullying (and the suicides that follow) in the suburbs and youth violence in the inner cities are both granules in the same pharmaceutical capsule – violence. only, the pharma company has got too many people to believe that the pill is two different things because it’s being packaged as two completely different products. as the actors go frolicking through a field of wheat telling you about how awesome they feel and how the “miracle” drug has changed their life yet, 3/4 of the commercial is spent telling you about side effects. the commercial for bulsophani is far more palatable because of the editing and the choice of music while oaklandia is just too raw and in your face and you’d rather forget about it. the bottom line is this. the same things are hitting everyone. until they are both looked at as an overall human issues, the cycle and “these” and “those” labels continue.